Why do you love selling? What is it that gets you fired up on Monday morning to get out there and visit with your prospects or customers? For me it’s real simple. I love to win. Sales is a competitive sport. I live for the thrill of victory and not the agony of defeat. The customer asks why they should buy from us. What is it that sets my company apart from the others? Many of the times the answer is you – the sales professional. Charles Coonradt is the author of The Game of Work. He mentions that one of the most important elements of your sales team is to know your people! What is it that turns them on when it comes to the game of selling? He talks about the importance of motivation – but how do you define it? Motivation actually has two components. The first is motive and the second is action. Understand that what motivates your people is the motive behind the sale which determines the action they take. 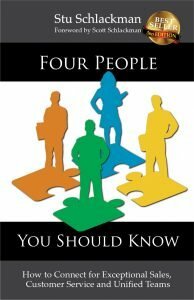 I totally agree with Coonradt who emphasizes the importance of knowing your people. Each member of your sales team is driven to sell by different motives. A persons’ personality style – identified by its color: blue, green, gold, orange – is key to understanding what motivates them, which is outlined below. Someone with a blue personality style is motivated by the need to build new relationships and satisfy their customers. When they sell, they sell who they are to the customer. Those with a gold personality are the best at selling their company. They are motivated to do what’s financially right by the customer. A green personality is your best problem solvers. They are motivated by giving your customer the best and most unique solution. Oranges are the best on beating the competition. They are motivated to win. Can you guess which personality style I have? When you understand what drives each sales person, you will better understand how to communicate with them in their terms. Their motive will drive their action which leads to greater performance and greater success! The other half of the equation is that your people need to know you, your personality style and your style of motivating them. They need to understand your perspective. If you are a Gold personality – focused on numbers, metrics and results – you will have a tough time motivating your Blue and Orange personalities who are relationship driven and not into the details of metrics. Your Green people can understand metrics but they are more interested in problem solving. As you manage your time, you’ll need to understand the needs of the various personalities. Blues are motivated by recognition and need more time with you. Oranges are more independent and don’t need much time; they are motivated by being appreciated. Greens enjoy their independence and do not need recognition and Golds like things tracked and are motivated by results. Understanding what drives your sales people is critical to your team’s success. And, it will help make team communications much more effective. As you get to know your customers’ personality style, ask for some insight from a team member that is the same style. This will give you a valuable perspective of the situation you might not otherwise see. – Leverage your team members’ strengths for versatility. Now that’s a winning combo!